Needs knocking down and rebuilding. We stayed for only 5 nights thank god. On arrival I burst into tears, that's how horrid I found the place. Decor was the most depressing I have ever seen. Everything was given to you in a cheap plastic cup (I never want to see one again). Kids running riot everywhere as ground of hotel are totally claustrophobic. Pool area was sparse and horrid also very small. We counted 42 sun beds for, say, 400 people. Hotel staff were ok, can't blame them for never hardly cracking a smile working there. The food was ghastly too. All in all have to say I hated every aspect of it. Needs knocking down and rebuilding. After reading some of the reviews we were really worried. The when we arrived late at night there were some drunken revellers slopping drinks in the lift. We were given a room on the 6th floor which overlooked a derelict area at the back somewhere so next day we asked to be moved. We were given a much better view without any problems. The food was of a good standard as was the cleanliness. The staff were friendly and helpful. 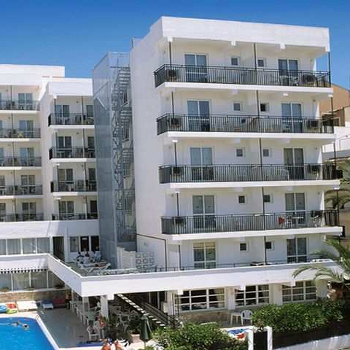 A short walk from the beach and overall good value for money. There are many issues with this hotel and to be honest most it's a case of you get what you pay for and if this hotel had the staff to cope with clientel it would be a fantastic place to stay for a family holiday. However the biggest problem I found with the hotel was the lack of staff and the resulting cleanliness. Cleaning of rooms consists of shaking down the top sheets and making the beds ,wiping down the toilet bowl(with the hand towels)and a change of bin bag in the tiny bathroom bin. No cleaning or sweeping of floors,No cleaning products used,Clean towels only every two or three days,Bedding only changed when requested. The result of this for my family was 4 days in bed vomiting.An experience shared by many, and from the stories I heard around the hotel it seemed the majority of guests were affected at some point during there stay. In the day time 1 member of staff runs the bar,They clean ashtrays and tables, serve drinks and snacks, and mop the floors from puking kids.How easy are those bugs already prevalent in the hotel going to be passed on? And when do they clean pipes from drink machines(where did bugs come from in the first place)? Thats just 1 area of the hotel and a small one at that but it does lead you to consider what goes on else where. The hotels answer to this problem was to snap at my wife for informing them of our sickness blame a bug in the air and take zero virus control action what so ever (by this i mean simple things like using bleach, moping communal areas,cleaning handles and lifts). If your booked and going already or already there eat out, drink out, use the stairs and avoid touching things. There are many issues with this hotel and to be honest most it's a case of you get what you pay for and if this hotel had the staff to cope with clientele it would be a fantastic place to stay for a family holiday. However the biggest problem I found with the hotel was the lack of staff and the resulting cleanliness. Cleaning of rooms consists of shaking down the top sheets and making the beds, wiping down the toilet bowl (with the hand towels) and a change of bin bag in the tiny bathroom bin. No cleaning or sweeping of floors, No cleaning products used, Clean towels only every two or three days, Bedding only changed when requested. The result of this for my family was 4 days in bed vomiting. An experience shared by many, and from the stories I heard around the hotel it seemed the majority of guests were affected at some point during their stay. A thought for you if you choose to ignore this is this, In the day time 1 member of staff runs the bar. They clean ashtrays and tables, serve drinks and snacks, and mop the floors from puking kids. How easy are those bugs already prevalent in the hotel going to be passed on? And when do they clean pipes from drink machines (where did bugs come from in the first place)? That’s just 1 area of the hotel and a small one at that but it does lead you to consider what goes on elsewhere. The hotels answer to this problem was to snap at my wife for informing them of our sickness blame a bug in the air and take zero virus control action what so ever (by this I mean simple things like using bleach, moping communal areas, cleaning handles and lifts). What a let down, room was dirty, after reading other reviews I took my own cleaning stuff and thank god! Hotel was full of people just wanting to get drunk and smoke themselves to death! The bar was always a long wait and they only give you small plastic cups so you have to keep going back up just to get a decent size drink. As for the pool, well we just had to laugh. It is so small and a lot of people on this site complained that there are not enough sunbeds around it. Well I think there are far too many for the size of it, and I told the manager that it is dangerous, over crowded, you have about a foot around the edge to walk. If you see any photo's then please take no notice as these don't give an honest picture. The manager at the Comics Bar around the corner (which is where we went every night) use to be a rep at the Piscis a couple of years ago and he said he gets lots of people coming in and complaining about the place. Now as for the food. Well I would rate it as only a 1 star hotel for that. Lasagne was on the menu one night, when I went to get some it was ravioli, so I thought that can't be right and then noticed the dish next to it, so I served myself some of that thinking that must be the lasagne, when I returned to the table to my amazement it was actually a ham and cheese sandwich from the snack bar which they had poured hot cheese sauce on top! Not enough staff and the bar man told us that the manager refuses to put on the air con in the bar as to make sure that guests don't get too comfy and want to stay in drinking all night. We went to the beach every day as did a lot of other guests, but you did get a lot of people out early with there towels to get one of the only few sunbeds there were. Never ate lunch as we went to beach all day we also ate out 3 nights, breakfast was the best food they served. Oh and check your bedding as they put a dirty sheet on my sons bed and you might want to take a mattress topper or you will feel every spring. hotel was cleaned everyday,you could see how much they really went into detail making sure noone was uncomfortable in any uncleniness.the food was ediable,they like to cook there meet in garlic,but there were always alternatives and chips for those fussy eaters!there was a great selection of every course!they could do with more sunloungers around the pool and a 'no reserving beds' rule,but then again it happens everywhere!the staff were very friendly!the hotel is not 5 star but then everyone already knows that,it was good for what it was though!i thought the location was superb!it was close enough to beach and shops that it wasnt a bother to walk but far enough so that you got a chance to see a little and catch some rays while you walk!entertainment was great for the children and adults,but its the person that makes it fun not the entertainment!if you going to sit and watch the karoke instead of joining in then its ovbiously not going to fun for you!you can get more than 10 drinks at the bar if you wanted and all the ice cream crisps and sandwiched you wanted!yes it was in plastic cups and the sandwiches wernt great but then again its better than nothing at all!the bar ques can get big but there giving away from alchol and other drinks so why wouldnt it be?plus they go down quick!overall i would have no problem staying there again and again!all i wish is that the whole hotel would be made non-smoking! hi, after treading other reports i was expecting an awful holiday, however i was pleasantly surprised, the hotel was spotless, the food was fairly good, their was an amazing choice,full english breakfast, or continental, lunch and dinner always consisted of 2 meat choices and one fish, with a vast array of salads and vegetables,to all the posts who say their was nothing they could find to eat, i wonder what they eat at home, one typical lunch was, lamb,beef or salmon. the drinks, including cocktails were good, the kids certainly enjoyed all the icecream. the location of the hotel was brilliant, about 200 yards to a fantastic beach. the staff were extremely helpful,when i wanted to keep the room on ,for the last day, reception juggled their room allocation and let us keep our room. entertainment isn't brilliant, but the afternoon activities in the pool were great, the kids loved it, at night there was a kids disco and games, one game of bingo, and some adult participation games. i would visit this hotel again, it is absolutely great for families. very clean rooms cleaned every day.